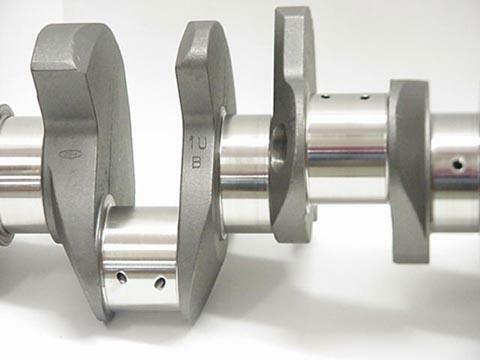 Ford crankshafts are identified by basic part number 6303. 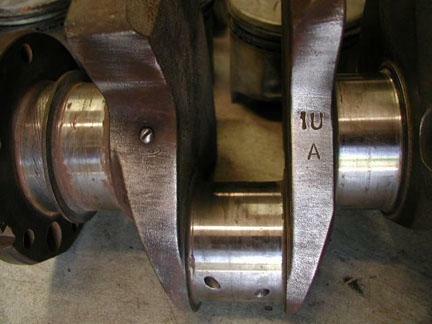 The crank used in 428 CJ and SCJ engines is made of cast iron with a 3.98-inch stroke. The main bearing journal diameter measures between 2.7484 and 2.7492 inches. 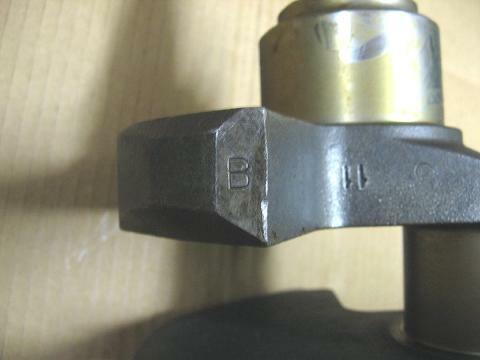 The connecting rod journal diameter measures between 2.4380 and 2.4388 inches. Several different cranks were used in 428 CJ and SCJ engines during the course of production. 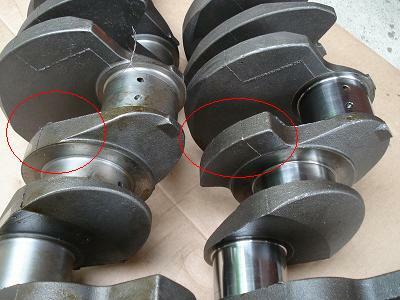 CJ and SCJ cranks are counterweighted somewhat differently due to the different connecting rods used in CJ and SCJ engines (the SCJ rods are heavier), which is why the SCJ requires an additional "cookie cutter" counterweight instead of the more common spacer on the crank snout. There appears to be very little difference between these cranks (except for the CJ vs. SCJ counterweight differences) other than the ways they were drilled for balancing. There were at least three different pistons used during production. Each difference in reciprocating mass required a change in crankshaft balance. In truth you can probably use any CJ crank in your CJ and any SCJ crank in your SCJ as long as you have the complete reciprocating assembly dynamically balanced. If you want to be a "numbers matching" purist, read on for casting mark and application details. * Both casting marks should be present. The C6AZ-B "1U" crank was replaced by the C9ZZ-B "1UB" crank at some point during the 1969 model year, with the later -B crank servicing all 428 engines assembled prior to 26 December 1968. At the same time, the C9ZZ-E "1UB A" crank was specified for all engines assembled after 26 December 1968. The crank change included a corresponding piston change. Similarly, the C9ZZ-A "1UA" crank was specified for all 428 SCJ engines assembled prior to 26 December 1968 and the C9ZZ-D "1UA B" crank was specified for all engines assembled after 26 December 1968. Again, the crank change included a corresponding piston change.